Get superior filtration from Aquasana's best performing under counter drinking water filter yet. The AQ-5200 2-Stage Drinking Water Filter delivers clean, healthy, great-tasting water from the convenience of your tap so you never have to wait for another drip pitcher again. The AQ-5200 selectively filters more contaminants out, like lead, chlorine, chloramines and cysts, while preserving beneficial minerals like calcium, potassium and magnesium. Aquasana gives you exceptional value, with water costing as little as 2.6 cents a litre when you replace your filters every six months. Each time you replace the filters, you can give yourself credit for not using 4,000 475mL plastic bottles. Protect your home appliances and plumbing from the adverse effects of iron and scale buildup and extend the life of your washing machine, water heater, dishwasher and other appliances. Aquasana SimplySoft is better than just a softener. Unlike salt-based softeners, SimplySoft won't dematerialize your water by chemically removing minerals nor will it put excess salt or chemical waste into our environment. SimplySoft uses advanced NSF Certified NAC salt-free softening technology to naturally and safely reduce scale buildup in hard water without the use of salt or chemicals. Independently tested by DVGW to Standard W-512 to reduce scale by 99.6%. CasaWater under sink stainless steel water filtration system designed to reduce a wide range of contaminants, improve taste and door and eliminate bacteria and viruses in the water you use for drinking, cooking and washing fruits and vegetables. The ultra filtration (UF) membrane combined with ultraviolet (UV) sterilization allows for effective disinfection while conserving the mineral equilibrium of the water. If you are a handy person, the installation would not require a plumber. 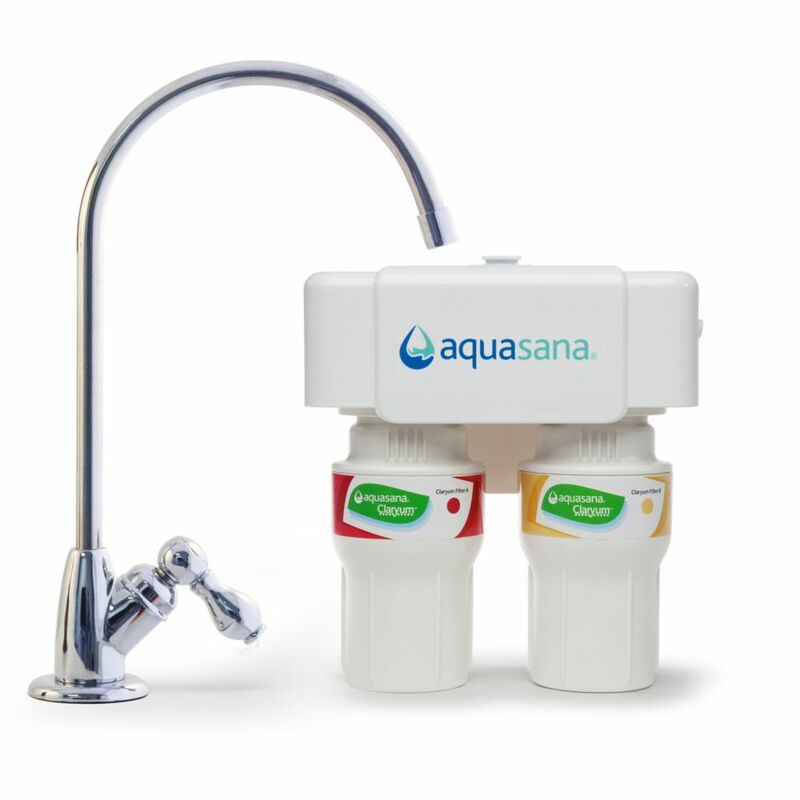 2-Stage Under Counter Water Filtration System with Chrome Finish Faucet Get superior filtration from Aquasana's best performing under counter drinking water filter yet. The AQ-5200 2-Stage Drinking Water Filter delivers clean, healthy, great-tasting water from the convenience of your tap so you never have to wait for another drip pitcher again. The AQ-5200 selectively filters more contaminants out, like lead, chlorine, chloramines and cysts, while preserving beneficial minerals like calcium, potassium and magnesium. Aquasana gives you exceptional value, with water costing as little as 2.6 cents a litre when you replace your filters every six months. Each time you replace the filters, you can give yourself credit for not using 4,000 475mL plastic bottles. 2-Stage Under Counter Water Filtration System with Chrome Finish Faucet is rated 4.4 out of 5 by 54. Rated 5 out of 5 by Slvrfx from I replaced a defective water filtration system from another company. The total replacement time t... I replaced a defective water filtration system from another company. The total replacement time to install was less than 15 minutes. I have only had the product for a few weeks but I am very satisifed at this time. Rated 5 out of 5 by Peveka from Works well and looks good. The company needs to provide longer plastic hoses for hook up or offer... Works well and looks good. The company needs to provide longer plastic hoses for hook up or offer option to select longer hoses when ordering. Rated 5 out of 5 by Rickbob from We have been extremely impressed! This is my third 2-stage under counter water filter from Aquasana! Installation was a breeze and the results as always have been absolutely fantastic. Rated 5 out of 5 by KipN from Easy to install, great performance value Easy to install and looks great! This is my third Aquasana product in ten years and very happy with the performance. A little worried with the filter alarm as my water is quite good a;d I usually get more than six months performance on a set of filters. Hope that thing is not buzzing at six months. Rated 5 out of 5 by Michael S. from Very pleased Great taste and easy installation. Overall very happy and will definitely recommend it. Rated 5 out of 5 by Pipo. from THE BEST SOLUTION IN FILTERS. THE INSTALATION WAS GREAT AND EASY. ITS USE WONDERFUL AND THE TASTE OF WATER GORGEOUS. THANKS AQUASANA.